When it comes to Bruce and Selina in particular, historically they've rarely been allowed to progress in any meaningful way for very long. Consistently, their growth as a couple has almost always been undone by the periodic line-wide reboot. This was certainly true of both the Crisis and Flashpoint reboots, both of which have also hurt their daughter, Helena Wayne (the original Huntress) in very significant ways over the decades. Still, when you look at the better aspects of DC's history, it has also shown that characters like Bruce and Selina can meaningfully age, move on from their need of their costumed identities, and still be recognisable as the characters we know them as. When you especially consider how Helena Wayne was originally developed to build on the legacy of her parents while simultaneously creating one of her own as the Huntress, it also showed that Bruce and Selina's torch can be successfully passed down to their offspring and make it count. It specifically showed that Bruce and Selina do not need to be immortal for their stories to matter or remain relevant. They just need to be given thoughtful character development over the course of their lifetimes so that when they do age and retire their costumed identities for a new life together, shifting the focus to their daughter feels like a natural continuation of their story, rather than the end of one and the start of another. Allowing Bruce and Selina to age and marry has been known to add more weight to their stories and provide depth to their characters in ways that made them truly unforgettable. That is exactly what was achieved with the original Golden Age characters and I figured now would be a good time to revisit them. Of course, we can't discuss that better part of their journey without first discussing how they got there. When we first meet Selina Kyle in Batman #1 (1940) she is not yet donning her iconic purple costume and she is simply known as "The Cat." Though we don't see very much of Selina in her first appearance, we still learn right away that she is--as her codename suggests--very smart and cunning, something that doesn't go unnoticed by Bruce Wayne. The story itself is centred on wealthy socialite Martha Travers and specifically her famous million-dollar diamond necklace, which is the obsession of every crook in Gotham. While Mrs. Travers is eventually attacked by a gang on her own yacht, her attackers still arrive too late as Mrs. Travers reveals--to her own amusement--that the diamond has already been stolen. This naturally upsets the gang. As everyone tries to figure out how anyone could've successfully stolen the diamond unnoticed, there is one detail everyone overlooks that Batman picks up on right away: the guest of Travers' nephew, Denny, the elderly "Mrs. Peggs" is not a guest of Travers herself. More suspicious yet is that she arrived at the yacht with a sprained ankle. 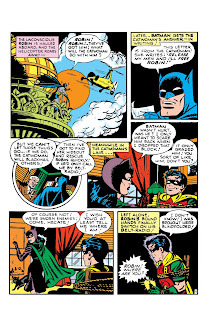 Batman and Robin pull a false alarm in order to scare the thief into revealing herself. "Mrs. Peggs" confirms Batman's suspicions, but with a twist: the elderly woman has very youthful legs. When Batman captures her, "Mrs. Peggs" is revealed to be a 20 year old woman under heavy prosthetic makeup, and the bandaged sprained ankle turns out to be hiding the missing diamond necklace. It turns out Denny's father (who is also Mrs. Travers' brother) has been losing money in the stock market for quite some time and needed to sell the necklace to recover lost investments. This resulted in them hiring "The Cat" to complete the theft for them as she is by far the most skilled at her craft. Needless to say, the fact Selina had almost gotten away with a very well planned theft made Bruce naturally attracted to her despite being already engaged to another woman, Julie Madison. Selina becomes attracted to the mysterious Batman herself, but doesn't allow him to take her into custody, quickly making her escape. 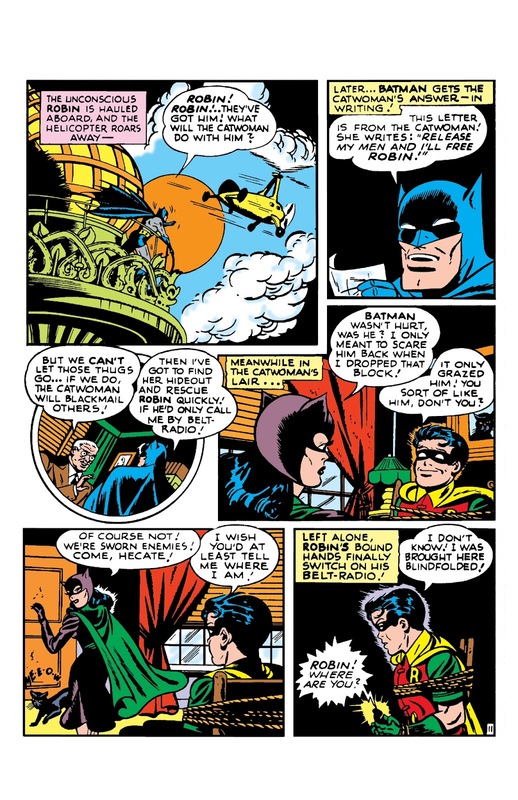 Though Robin wants to go after her, Batman "accidentally" prevents him from doing so, stating they'll eventually run into her again--something he very much looks forward to. Do we even need to point out Robin notices the obvious attraction his mentor has for the clever female thief? Fortunately for Bruce, it isn't long before he encounters Selina again (now referred to as the Catwoman) in Batman #2. A GAME OF CAT AND...BAT? Like in the first story, Selina is once again hired by a criminal gang known as the Crime Syndicate (not to be confused with the Earth-3 supervillain team of the same name) to use her skills in assisting with the Joker's escape. Once Selina fulfils her part of the job, she is immediately captured by the Batman and is made to reveal the Joker's location in exchange for her freedom. Since Selina is no longer bound by obligation to the Syndicate, she tells Batman what he wants to know. Though Selina's part in this story is small, it is by no means insignificant. Later on when she decides to steal valuable jewels known as the Pharaoh's gems, she finds herself crossing paths with the Joker himself. Robin intervenes but is immediately taken out by the Joker. Just before the Joker can finish killing the 8-year-old boy, Selina offers to give him the jewels in exchange for the boy's life. Selina also protects Robin while the Batman challenges the Joker to a duel, once again showing that despite her criminal tendencies, she is still a good person at heart. Though Batman invites Selina to come with them, she still makes her escape, effectively setting up a precedent for encounters to come. The next time Bruce and Selina have a significant encounter, it is in Batman #3 where Selina also dons her first Catwoman costume, which is basically a cat mask over her head while she wears a dress and a cape. It is also the first story where she is seen using theatrics for the first time to carry out another theft she was hired for by another client also looking to recover stock money. Use of theatrics is another thing she has in common with Bruce, but the more significant detail of this issue is that we see Selina reciprocate Bruce's feelings for the first time. Bruce doesn't hide the fact that he is interested in Selina in a romantic manner, not even from his sidekick, Robin. In this issue, however, we see Selina kiss Bruce (as Batman) for the first time, both as a distraction and as a serious romantic gesture. The issue additionally ends with Selina thinking about how nice it would be for her and Batman to go out on a normal date, not as Batman and Catwoman, but as two ordinary people. The next time we see Catwoman in Batman #10, she has by then formed her own gang, complete with her own henchmen. However, she also starts questioning her life choices and particularly the dangerous nature of her lifestyle. Nonetheless, she still shows her cunning in the way she meticulously plans her thefts so that its not obvious to the people she's robbing that they're being robbed. 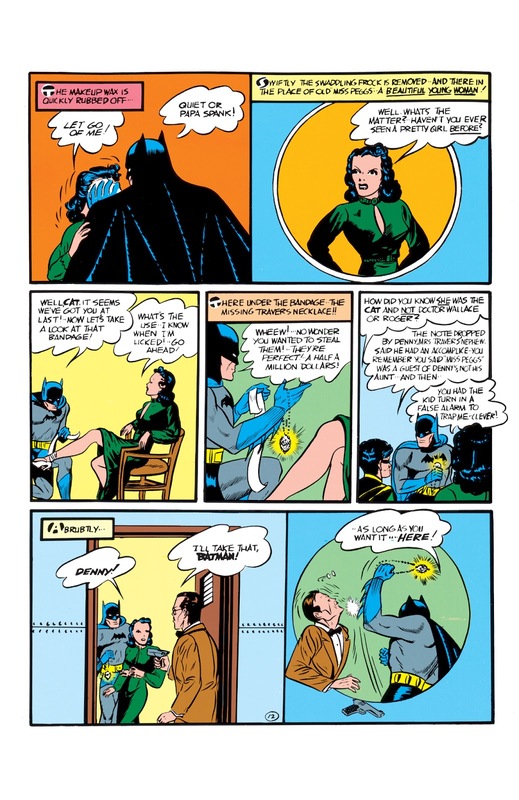 Selina also continues to show her mastery of disguise by passing for a wealthy socialite as "Marguerite Tone," which succeeds at fooling everyone but the Batman, who also challenges her to a game of wits. Though Bruce once again foils her plans as Batman, he also continues to show that he cares about her and even saves her from being killed by her own henchman when caught. Selina kisses him for a second time and Bruce once again lets her "slip away." This becomes a recurring pattern for them in their subsequent encounters. By Batman #15, Selina Kyle starts considering giving up her life of crime in exchange for a quiet ordinary one. She takes up a normal job as "Elva Barr" at a salon and even participates in a beauty contest for salon operators, in which Bruce Wayne is also a judge. Bruce is surprised to see Selina there and expects her to execute a new scheme. To his own surprise, she is in fact there for honest reasons and has trouble accepting she has "turned over a new leaf." He decides to keep an eye on her to be sure. Bruce and Selina go on various dates together and each time Selina proved her sincerity to Bruce. He then decides to put her through one more test by proposing to her, again without notifying his girlfriend Linda. Selina believing the proposal is real accepts and communicates to her gang that she'll no longer be pulling heists as she wants to start over with Bruce. Her henchmen don't believe Bruce is really taking her seriously as he's been steady with Linda Page for quite sometime. Selina was unaware of this and decides to conduct a sincerity test of her own against Bruce, effectively causing his own plan to backfire. Hearing the news of Bruce's engagement to the mysterious "Elva Barr," a heartbroken Linda Page finds herself feeling angry and hurt, but nonetheless decides to "meet" the new woman in Bruce's life. Selina is surprised to see Linda at her salon but also doesn't take long to figure out why she's there: she wants to evaluate "Elva Barr." Selina plays along, though Linda does not suspect Selina's plan to make a cast of her face from her facial in order to trick Bruce into revealing his true plan to her by posing as her. 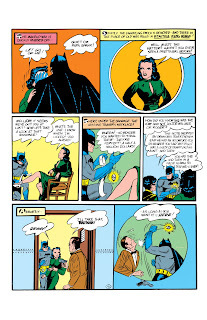 Bruce falls into Selina's trap by revealing to "Linda" that he is only "engaged" to Selina as a favour to Batman to see if she is in fact reforming. Realising Batman had only been interested in rehabilitating her, this naturally upsets Selina who then doubles down on her crime sprees as a way of "getting even" with Batman. By the time Bruce finds out what really happened during his encounter with "Linda," he realises too late the damage he's caused. In addition to needing to make amends with Linda, Bruce also no longer decides to give Selina any more chances to give up crime and takes her to the police for good this time. Though things didn't end well with the Catwoman and Bruce accepts responsibility for his role in sabotaging her genuine efforts to change, he still holds out hope that she will still change for the better. While Selina's next appearance occurs in an "Adventures of Alfred" story in Batman #22, it is not until Batman #35 that we get a serious follow-up to the events of Batman #15 and the toll that it had on Selina moving forward. 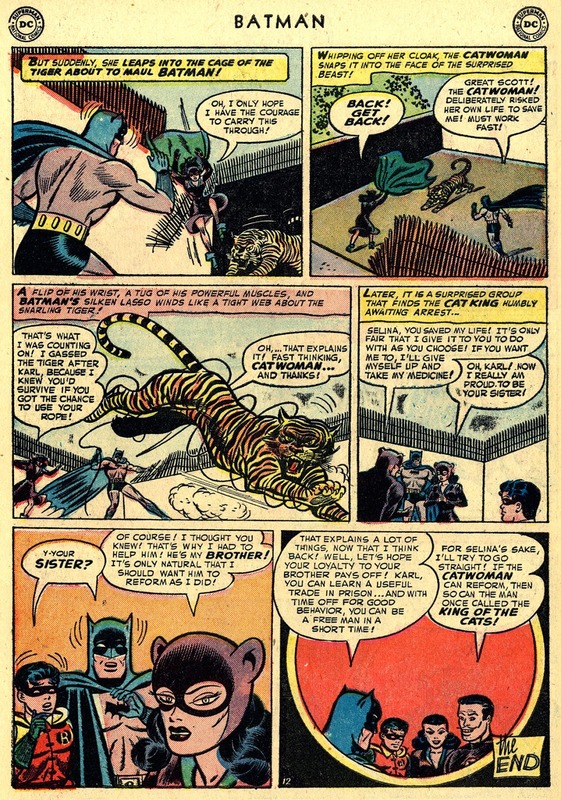 This is also a significant chapter because this story marks the first appearance of Catwoman's iconic purple dress with the green cape and her famous cat-o-nine tails. We also meet her famous black cat in this story named Hecate (after the Greek goddess of the crossroads and sorcery) and the use of cat puns. In Batman #35, one of the major repercussions explored from the events of Batman #15 is that following her effortless escape from prison, Selina's old gang no longer confides in her to successfully carry out a heist because the Batman always ends up foiling her plans. Selina then finds herself in a place of needing to regain their confidence, which once again sees her rely on her craft to successfully manipulate her henchmen back to her favour. Another way Selina responds to Batman's betrayal of her in the previous story is that she starts tripling down on her crime sprees as a way of empowering herself. She also no longer goes soft on Batman whenever he interrupts her heists and does genuinely fight him to keep him from sending her back to prison. This becomes the new norm of their encounters in all of the stories that follow. However, when given the opportunity to kill the Batman or his sidekick, she refuses each time indicating that she still has feelings for Batman. This naturally confuses her henchmen, but manages to excuse herself by pointing the very obvious fact of not needing to add murder to their prison sentences. This was certainly notable in Batman #39, where she also--once again--expressed romantic interest in Batman. It is not until Batman #62 where Selina makes another honest attempt to give up her life of crime for an honest normal life. Following an accident in which she saves Batman from being crushed to death by a falling brick wall, she reveals to the dynamic duo that she was a stewardess named Selina Kyle, who was involved in a plane crash some ten years earlier. She is especially shocked to learn that during the time she acquired amnesia, she had committed various crimes as Catwoman. This is the first time Selina reveals her real name to Batman and Robin and also the first time the character is given a backstory. Though Bruce surprisingly doesn't seek to verify Selina's story, he nonetheless gives her the opportunity to prove her sincerity by helping him capture a mysterious Mister X, who had solicited the Catwoman's help earlier. Selina doesn't waver in her deal with Batman, and together, the trio capture the mysterious new criminal who turns out to be none other than a low tier criminal known as Mousey. Following this first exploit, Selina is dismissed of all charges for her past crimes as Catwoman due to amnesia, and settles for opening a pet store. From this point forward, Batman starts soliciting her help on cases that could use her expertise, effectively showing that he believes in her and sees her as his ally rather than his enemy. Despite Selina's desire to move on from her criminal career, her past as Catwoman does come back to haunt her on a few occasions. First, when a gangster named Whale Morton steals her cat-themed MO as a way of coercing her back into a life of crime in Batman #65. There is also an attempt by her own brother, Karl Kyle, to lure her back into this lifestyle when he decides to take up her legacy as the Cat King in Batman #69. In both cases, Selina didn't waver, maintaining that she was committed to living an honest life and that she put her former life as Catwoman behind her. She tricked Whale into appearing at the scene of one of his own crimes in order to facilitate Batman's capture of him. She also eventually dissuaded her brother from pursuing his criminal career further, indicating that she still cared for him and that she did in fact no longer needed Catwoman. This impresses Bruce significantly, and maintains his respect for Selina that will eventually carry over into the Bronze Age. 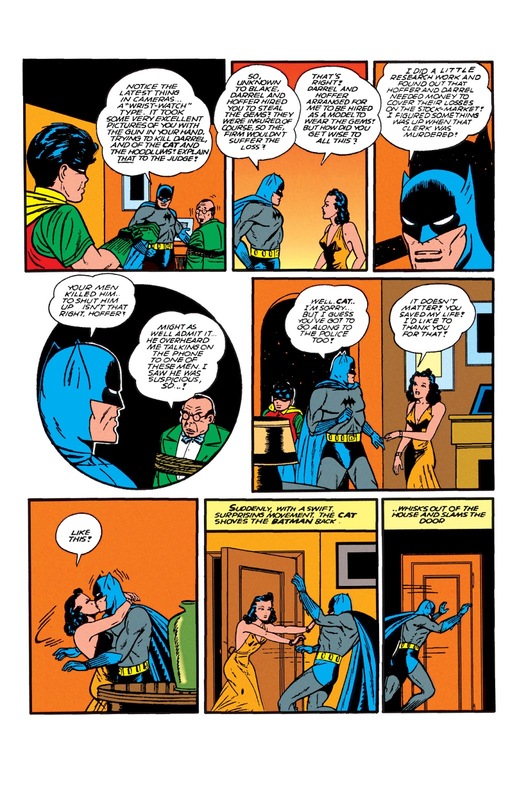 Following the story with Selina's brother in Batman #69, both the Batman and Detective Comics ongoing series started transitioning into the Silver Age style of storytelling, which offered less nuanced portrayals of characters and the stories themselves were largely gimmicky. 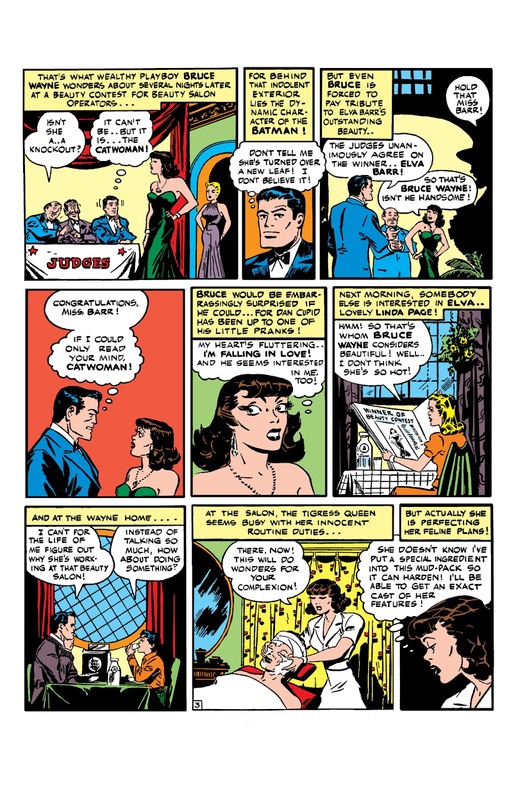 This change in style reflected in the regressive characterisations for both Bruce and Selina when they made their final Golden Age appearances in 1954. 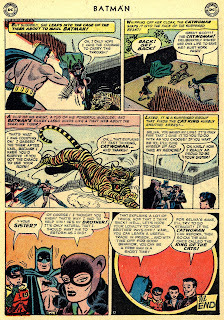 By Detective Comics #203, Selina had ditched her attempts at a normal life by returning to crime as Catwoman, and Batman was also back to viewing her as a criminal rather than his ally. 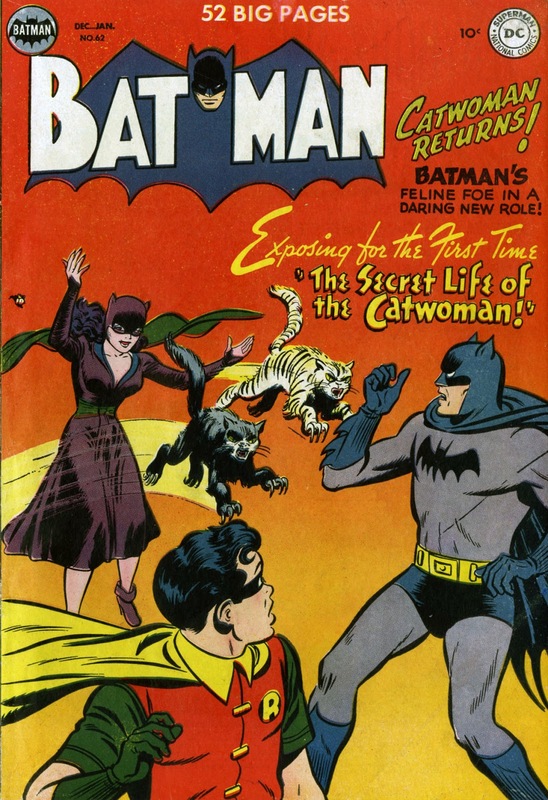 Some fans argue Detective Comics #203 is the first appearance of the Silver Age Catwoman due to the regressive characterisation she was given, which continued well into the 1960s. Given that her brother never resurfaced following her return to crime, there is validity to this speculation. However, considering that her last three stories in 1954 (including this one) still referenced events that happened in the Golden Age (such as the fact that she reformed and opened a pet shop), it can still be argue that this is still the Golden Age Catwoman and that her brief return to crime could be owed to a moment's madness. Whatever the conclusion, we didn't learn for certain what became of the Golden Age versions of Batman and Catwoman until the establishment of the multiverse in 1961. This also established DC's Golden Age stories and heroes as existing on a separate Earth from their Silver Age counterparts. Because the Silver Age Earth was then considered the modern DC Universe, that world effectively became Earth-1, and DC's Golden Age Earth became Earth-2. With writers now looking to further develop DC's Golden Age heroes and modernise their mythology for a newer generation, this led to writers following up on plot threads that were left behind in the 1950s. This included following up on whether or not Selina Kyle truly reformed during that time and how this affected her relationship with Bruce Wayne. A topic that will be discussed in Part 02! I concur with your assessment as to Detective 203 which would match the narrative in Brave and Bold 197 placing that tale in 1955 following her re incarceration.